Eat the RaInbow-What Is That? Foodie and Friend of the Small Farm, I Am. Traveling to learn other cultures is the finest education! Fresh berries in Helsinki. 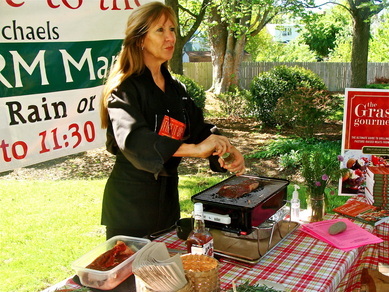 In The Grassfed Gourmet Fires It Up, Annapolis, Maryland-based chef Rita Calvert helps grillers understand what makes ‘grassfed’ different and shows how, with a few simple strategies—supported by more than 100 outstanding recipes—these higher-quality, healthier meats can really shine on the grill. All but 2 photographs in The Grassfed Gourmet Fires It Up! were taken by Rita as well as the images on her food blog. “Today’s close working relationship between farmers and chefs not only contributes to everyone’s eating pleasure, it provides a wealth of information that we can use in our own farms and kitchens. In this lovely book we learn how to produce and prepare meat from grassfed ruminants. Enjoy!” --Frederick Kirschenmann, Stone Barns Center for Food and Agriculture. Pen & Ink Critter Doodles by Rita-contact me!